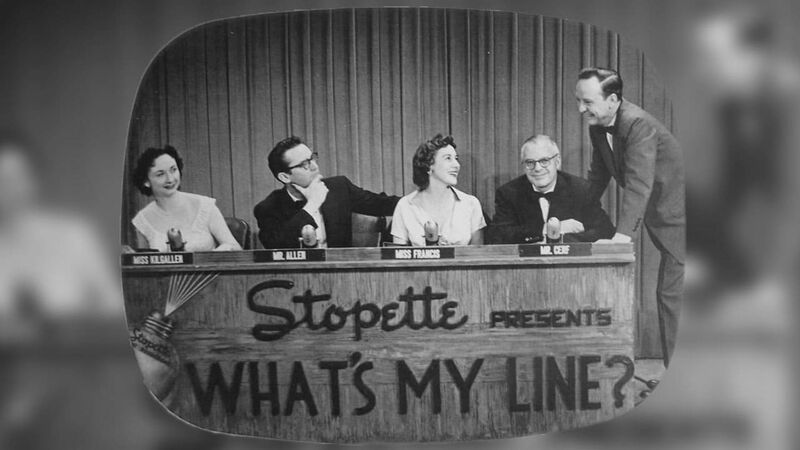 Here's where to watch every episode of What's My Line? season 11. Mouseover or tap an episode to see where to stream it. Click or tap the play icon to stream it on the best available service. Garry Moore Sep 27, 1959 Game 1: Glenn Stoneburner - ""Tests Tubas (For Musical Instrument Mfr.)"" Game 2: Barbara Morris - ""Seal Trainer"" Game 3: Garry Moore (as Mystery Guest) Game 4: Nancy Weis - ""Fills Orders For World Series Tickets""
Julie Andrews Feb 7, 1960 Game 1: Don L. Brown - ""Director of Physical Education at Women's College"" Game 2: Thelma Wagner - ""Makes Horse Blankets"" Game 3: Julie Andrews (as Mystery Guest) Game 4: Judy Joye - ""Professional Skin Diver (Search, Salvage, Instruction, Etc.)"" Charles Laughton Feb 21, 1960 Game 1: Cordelia Sharp - ""Motorcycle Cop"" Game 2: Lin Brown - ""Runs Marriage Bureau (Matchmaker)"" Game 3: Charles Laughton (as Mystery Guest) Game 4: Tobias Cohen - ""Sells Used Aircraft Carriers, Battleships, Cruisers, Etc."" Jane Fonda Apr 3, 1960 Game 1: Louise Eammons - ""Census Taker (Took Census at Homes of our Panel)"" Game 2: Nick Padilla - ""Designs Maternity Clothes"" Game 3: Jane Fonda (as Mystery Guest) Game 4: Edward Fenn - ""Butler""
Gertrude Berg May 8, 1960 Game 1: Betty Rode - ""Butcher"" Game 2: D. Ronald Adams - ""Baker Wedding Cake for Princess Meg"" Game 3: Gertrude Berg (as Mystery Guest) Game 4: Manny Schoedes - ""Candlestick Maker""
June Allyson May 22, 1960 Game 1: PFC Mary Luksis - ""Dental Technician for West Point Cadets"" Game 2: John Torp - ""Runs Flea Circus"" Game 3: June Allyson (as Mystery Guest) Game 4: Sue Mandel - ""Trombone Player""
Jane Wyman May 29, 1960 Game 1: Mary Ann Messiek - ""Justice of the Peace"" Game 2: Charles T. Reece - ""Inspects Atlas Missiles"" Game 3: Jane Wyman (as Mystery Guest) Game 4: John W. Mullhen - ""Sells Hay""
Elaine May & Mike Nichols Jun 26, 1960 Game 1: Arthur Mercate - ""Beer Salesman"" Game 2: O.T. Gillett - ""Cowboy"" Game 3: Elaine May & Mike Nichols (as Mystery Guest Duo) Game 4: Mitch Shapiro - ""Puts Sticks in Popsicles""
The Trapp Family Choir Jul 3, 1960 IDENTICAL TWINS NIGHT! In honor of the 26th Annual ""International Twins Association"" Convention, all of the regular contestants are identical twin sets who are dressed alike. Game 1: Miss LaVelda Rowe & Miss LaVona Rowe - ""News Photographers"" Game 2: Miss Barbara Harker & Miss Virginia Harker - ""Sell Worms"" Game 3: The Sound of Music (as Mystery Guest Cast) Game 4: Bernard Ross & Howard Ross - ""Dentists"" WML will again have a ""twins night"" on EPISODE #847 on January 29, 1967. Zsa Zsa Gabor Jul 24, 1960 Game 1: William C. Westmoreland & John Davidson - ""Superintendents: West Point & Annapolis"" aka General William Westmoreland & Admiral John Davidson Game 2: Nancy Pomroy - ""Lobster Fisherman"" Game 3: Zsa Zsa Gabor (as Mystery Guest #2) Game 4: Maureen Napier - ""Tour Guide on Sightseeing Boat (New York City)""
Myrna Loy Jul 31, 1960 Game 1: Sherrylyn Patecell - ""Rockette (Dancer at Radio City Music Hall)"" Game 2: Syd Simons - ""Make-Up Artist (Did Speakers at GOP Convention)"" Game 3: Myrna Loy (as Mystery Guest) Game 4: Frank Prudenti - ""Bat Boy for N.Y. Yankees""
Dina Merrill Aug 7, 1960 Game 1: Arnold Palmer - ""Professional Golfer and Masters and National Champion"" Game 2: Michael Jackson - ""Rock â€˜N' Roll Disc Jockey"" Game 3: Dina Merrill (as Mystery Guest #2) Game 4: Doris Mossotto - ""Dog Catcher""
Bette Davis Aug 28, 1960 Game 1: Robert, Theodore, Allan & Arthur Specht - ""Registered Nurses"" Game 2: Pat Hayes - ""Rides Brahma Bulls in Rodeos"" Game 3: Bette Davis (as Mystery Guest) Game 4: Anne Maciag - ""Zipper Tester""